This unusual "Nativity Set"conveys a rich and poignant message. Incarnation and redemption, life and death are in the hand of God. The hand of God is a very ancient iconographical motif. The invisible God manifests his active presence in this world through his visible hand, as can be seen in many icons. In a special way, God's hand is the hand marked by the stigma of the Passion, the redeeming hand. But it is also a hand that does not work in solitude. Each one of its fingers is reinforced and prolonged by one of five saintly figures. Part of God's might is in the cooperation and help he receives from us, from human participation. 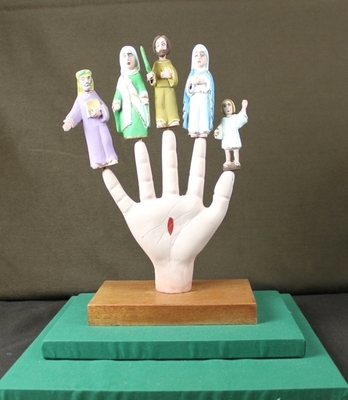 The Mighty Hand, a typically Hispanic tradition, is a genealogical tree. It shows, from left to right, Joachim and Anne, Mary's parents, and Joseph and Mary with Jesus. Thus, the Mighty Hand has also the meaning of an abbreviated Tree of Jesse, signaling that God is a God of history and human generation. Handcarved, painted wood sculpture depicting the genealogy of Jesus, including Mary and Joseph, and Mary's parents Joachim and Anne. The artist, exact date and place of creation are all unknown. Exhibition label originally written by Fr. Johann G. Roten, S.M. for exhibit entitled "At The Manger" and held at Roesch Library, University of Dayton.